Liverpool were held to a 2-2 draw against West Ham at Anfield this evening. The home side drew first blood through Adam Lallana early in the first half. Sadio Mane’s dangerous delivery landed at Lallana’s feet, and he finished expertly. 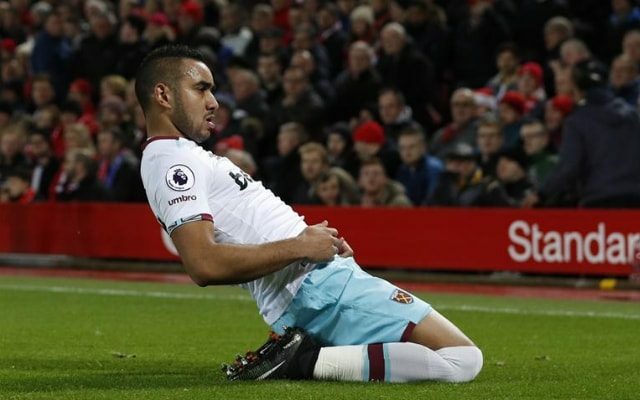 Dimitri Payet then levelled the scores with a free-kick, which Loris Karius will be disappointed to have conceded as he gave the Frenchman far too much of the goal to aim at. Karius was arguably at fault for West Ham’s second too, as he was uncertain whether to come and claim a lofted ball and instead allowed Michail Antonio a simple finish. Divock Origi drew Liverpool level just two minutes after the half-time break; and there was further, appalling goalkeeping on display. Darren Randolph flapped at a cross and Origi had a simple finish. Liverpool player ratings: Karius 2, Clyne 6, Matip 5, Lovren 6, Milner 4, Henderson 7, Wijnaldum 6, Lallana 7, Mane 5, Origi 7, Firmino 5. West Ham player ratings: Randolph 4, Nordtveit 6, Reid 6, Ogbonna 6, Ayew 4, Noble 6, Obiang 6, Cresswell 5, Lanzini 5, Payet 8, Antonio 7. Man of the match – Dimitri Payet: Payet has been unable to replicate last season’s level of performances this term, but today we had a taste of the Payet of old. His performance was epitomised but a moment of quality from a free-kick.